Was the new architecture created for the Beijing Olympics sustainable? Frankly, I don’t think they are sustainable, because they just cost so much to build and consumed so much steel and energy. So, that’s my answer, but, certainly, I’m proud that China can handle such a big event. That doesn’t necessarily mean that I like this kind of big event. It’s certainly not sustainable. Right now, Beijing has a shortage of water, bad air quality and traffic. These big buildings consume so much steel – ten times or even 20 times as much needed to build a similar kind of venue, or sport facility. So, that’s a huge waste. Also, in terms of the landscape, it’s such a mono-functional piece of land. Beijing has a serious problem in terms of water shortages. Its underground water will drop one meter every year. Ornamental landscaping consumes so much water. In terms of sustainability, I don’t think the landscape is sustainable. As a Chinese, I feel proud that China can afford this, but I also feel we need to think that this kind of show should not happen often. Please explain why you decided to call your firm Turenscape. That’s a good question. Tu-ren is two characters in Chinese. Tu means dirt, earth, the land. Ren means people, the man, human being. Once these two characters come together, it actually means earth man, which also expresses my understanding about land and people. It’s a relationship between land and people. The firm’s ideology, or the firm’s concept, is to create harmony between land and people. That’s called Turenscape. Turen and scape. It’s dirt man landscape, or earth man scape. Earth man landscape. In an interview with Time Magazine, you said China needs a dramatic shift. “We’ve misunderstood what it means to be developed. We need to develop a new system, a new vernacular to express the changing relationship between land and people.” What should this new language be? The new language should be native in terms of material and plant use. Secondly, it must be for the common people, normal people. We should not consider this high-culture, traditional landscape gardening as the solution for modern China. We should find a new solution, which I call the vernacular – a new technology for common people from local vernacular materials. It should address the issue of survival, not pleasure making, or ornament. It should be for survival, because we are now, as human beings, at the edge of survival. Especially in China, we are at the edge of survival. We have a serious shortage of water, and our water’s been polluted. 70 percent of our surface water has been polluted. And the underground water is dropping. We are at the edge of survival, because we all have only 7 percent of natural resources – water, energy – but we have to take care of 20 percent of the world population. That’s an issue of survival. The new vernacular is different from the old vernacular. The old vernacular is agricultural based. It’s survival for agricultural China. And that’s a low culture. It’s a vernacular low culture. For 5,000 years, Chinese agriculture has developed this vernacular to adapt to the land and people. At the same time, we developed a kind of high culture. Chinese gardens and Chinese ornament, paintings, and poems. This high culture does nothing to ensure survival. It’s only for the pleasure-seeking of the elite, the emperors, only for the high class. Now we are again at the stage of survival, not only for the farmers, not only for the normal people, but also for the higher classes. That’s why we need to pick up this low culture, because that’s the culture for survival. We have to develop a new set of survival skills based on low culture. This low culture, the vernacular Chinese culture, is seldom mentioned in text books by Westerners. It’s not being talked about, so we know little about how normal Chinese actually survive through these skills. I think now we have to deal with the issue of survival, but with new survival skills. I call landscape architecture an art of survival. What you’ve said relates to my next question. Landscape has played a key role in Chinese arts. Traditional Chinese landscapes are featured in brush painting, and poetry. How can the new landscape architecture like you’re talking about revitalize reverence for nature in China? High culture landscape gardening should be considered a heritage – a dead heritage, not a living heritage. The Chinese have a living heritage. This is the low culture of agriculture, field making, irrigation, and land use. That’s the tradition we should carry on. We should make it living today. We should make it function today. Not as a brush painting, not as garden making, not as ornamental display. We mistakenly take high culture as our only tradition. We forget we have really functional and useful low culture. That’s the vernacular, the functional vernacular. Many Chinese cities that have gone through new development are sometimes starting to look the same. I noticed this on some of my travels when I was there. What are the main arguments you made to urban planners to use a “negative approach,” as you’ve said in the past? This is what I’m trying to do: Reverse the approach to urban and regional development planning. Conventional planning is based on population growth, and oriented towards economic development. Development becomes the focus. You assign a certain amount of land for development, and new infrastructure that allows for the development. That’s the conventional model of urban planning. My idea about negative approach, or reversed approach, is that landscape should lead the way, which means we should plan and design ecological infrastructure. This should be the basis for urban development, and occur before other planning is done. This kind of plan safeguards the ecological process and cultural heritage. This means we integrate storm water management systems, flood area, biodiversity conservation, cultural heritage sites, green corridors, etc. All together. We integrate them into a kind of infrastructure. In America, we call this green infrastructure, but I also hear the term ecological infrastructure used, which specifically focuses on ecological processes to secure ecological services, including clean water, clean air, biodiversity, enjoyment, recreation and cultural heritage. China’s one of the most diverse landscapes in the world, with deserts in the north, jungle in the south, southwest. Please describe the design challenges and opportunities associated with these different terrains. How are the social, the economic, the design solutions for Tianjin different from Xi’an or Lijiang in the southwest? This is exactly what I mean by a negative approach because the identity of each city is given by nature. Secondly, it’s given by the history. Identity comes from diverse landscapes and natural systems in China. You’ve got mountains, rice paddies, the plain- Tianjin is a flat plain. The Chinese have developed a diverse culture, because culture is a means of adaptation to environment – a way to use the natural resources, to survive. That’s why China has a diverse cultural landscape – in the mountains, plains, forest, and flood plain. In order to create and protect the identity of each city, we actually should go negative first. Negative planning is needed in order to preserve a kind of ecological infrastructure and keep the natural process intact, secure the natural process, and secure the cultural heritage of individual areas. Zhongshan Shipyard Park, which won the 2002 ASLA Honor Award, and the Red Ribbon project, which won the Design Award in 2007, offer different sides of your landscape architecture. Please describe how these projects reflect your philosophy. What are the common elements? Wonderful question. The Zhongshan Shipyard Park reflects my idea of how to recycle, use and recover brown field in the city – to recover the ecosystem. At the same time, the park keeps the memory of the city and history of the city, even if the history is only 30 years old, like the ship yard. It was built in 1950s, and went bankrupt in the 1990s. Normally we would wipe out this kind of old factory, because it’s nothing special compared to other Chinese historical sites. It doesn’t fit into the Chinese traditional idea of aesthetics. It’s nothing beautiful. The idea here is that we should take care of the common people, not the emperor’s. These normal people also have a history that’s very important. In this park, weeds or native plants, which have been considered ugly or wiped out, are allowed to grow. The weed is a native grass, native plant. In Zhongshan shipyard, we actually demonstrated two things: one is the common, the everyday, the vernacular, normal people, the old, bankrupt factory. The second: we should create new aesthetics, the new ethics of the environmental conservation. We used native plants, native species. Both of these things were unusual in China at that time, five years ago. I was seriously attacked by traditional thinkers. They thought it was ridiculous. Now, it has become more accepted by society. The Red Ribbon demonstrates another important idea – minimal intervention, ecological minimalism. It’s not formal minimalism, but ecological minimalism, which means we can create a dramatic landscape through minimal intervention. We don’t have to build those gigantic, baroque-style landscapes. We can actually just build a tiny, skinny red ribbon, and it’s functional. We integrated all these functions urban people wanted: seating, board walks, and lighting. We should not take more than what we need. We should create what we need – minimal intervention and use modern art, modern technology. It’s called modern, but you can see it’s still Chinese. Red Ribbon: it has Chinese color, and style. The Red Ribbon demonstrates my idea about how we can create a very normal landscape, yet make it dramatic. 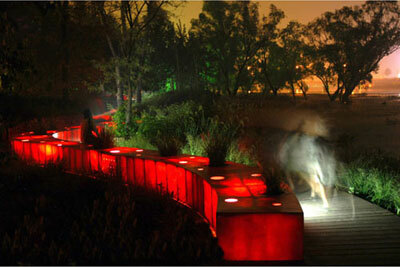 Another project is the Floating Garden, Yongning River Park. This park demonstrates an ecological approach to flood control. More than ever, Chinese rivers have been channeled through concrete, “hard scape.” It destroys the whole river system. This project demonstrates we can use landscape as an approach for flood control. We can create a sustainable flood control landscape, take out all the concrete, use native plants, create a multifunctional green space, and green corridors, which can retain water and reduces the strength of a flood. It’s a floating garden. People, the process of flooding, biodiversity, the biological process of conservation, and a human process of recreation, can actually come together. They can use the same space, maybe at different times and different layers. The idea is to create a harmony between land and people. I understand you mailed your book, “The Road to Urban Landscape: A Discussion with Mayors” to thousands of city officials across China. What were the results of directly engaging with Chinese urban planning officials? Do you think a national dialogue has begun in China on sustainability and landscape? The book was written in 2003. The early version of it was my TV show, “TV talk,” which was shown in 1998. Chinese landscaping is often so unsustainable because mayors and decision-makers don’t understand what sustainable landscape is. Chinese mayors come to the US, or European countries, and see those baroque landscapes, gigantic unsustainable buildings, urban squares, and civic centers. I thought I should educate China’s mayors, and tell them what are good landscape architecture and urban environments. That’s the purpose of the book. In this book, I criticize bad urban designs, urban landscapes and buildings in the city, and tell them the truth. The truth is that the CCTV tower is not sustainable. 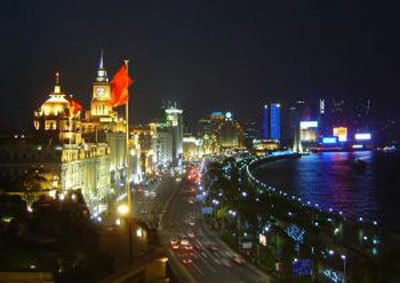 The Shanghai Boulevard (the Bund) is not sustainable. I also tell them that America has made many mistakes. We should not follow these mistakes, but learn from them. I also show them that European countries have also made hundreds of mistakes. We should learn from those mistakes, not copy those images. In this book I propose we should create sustainable landscapes, use a negative approach, and build a sustainable infrastructure – landscaping as infrastructure. The landscape should be seen as an ecological process, an ecological infrastructure, not as an ornament, not as a city built for touring. Americans have the cities beautiful movement. I tell China’s mayors that the cities beautiful movement has many mistakes, and we should learn from that. We should care for the very delicate eco-systems, and cultural heritage in China, and build a real livable and sustainable landscape. In Kunming in Yunnan province, old French colonial style buildings were torn down in the late ’90s. 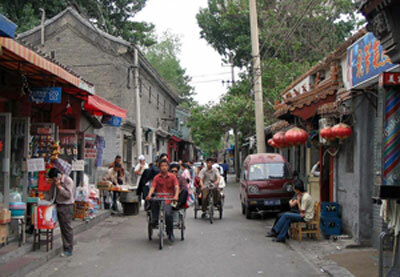 In Beijing, old hutongs have been wiped out, replaced with large streets with medians, and tall apartment buildings. Do you support tearing down these old buildings that may look beautiful, but are difficult to live in? What are the design and economic arguments for restoring old buildings? If they’re restored, how can average Chinese afford to live in them? That is a really difficult question. It’s a hard question. Certainly, there are a couple of models to use these for this kind of cultural heritage. The new city could have been build on new location and we could keep the old city. The old city becomes a tourist site, become a tourism city. That’s what happened in Lijiang in Yunnan province, and it can attract tourists, and be functional, economically. The other model is the Beijing hutongs. Low income people live there. You can still develop, and you can create diversity in the area. If there are low income families that still want to live there, it’s OK. The government should subsidize at least some for the renovation of these areas. And at the same time, if they want to leave to have apartment outside of this city, they can certainly move. They can sell their courtyard to higher income, richer people. Courtyards can be used for tourism — hotels, bookstores, coffee shops. Economically, it’s valuable. In terms of protecting heritage, it should be the number one consideration. In terms of social issues related to keeping the native or local owners on site, I think you have to consider it on a case by case basis. China is not like America. We don’t have racial issues. For a long time, the income of every Chinese was almost the same. Now, urban development will create a group of rich people. I think it’s OK if rich people want to buy a courtyard. This will at least create a better space for poor people and let them live in a better situation. At the same time, the government should provide some subsidies so local people can stay. They created a kind of a culture, an authentic culture in these hutongs. If the old Beijing people want to stay here, if their style of living style becomes a tourist attraction, I think the government should certainly pay back. What advice do you have for Chinese landscape architects working in the US, and American landscape architects working in China? The human species is now at the edge of survival. In China, we are right at the edge of survival. So if we can solve the problem in China, we can solve the problem in the rest of the globe. Americans and Europeans can benefit from saving China, because the globe is a globe. It’s a whole ecosystem. So, I think American landscape architects need a battlefield. American landscape architects have created tremendous, wonderful ideas of sustainability, ecological planning, social justice and environmental stewardship. For more than 100 years, the American landscape architects profession contributed greatly to the profession of landscape architecture by making it different from landscape gardening. That’s a great contribution. We went from private, ornamental-based, pleasure-making gardens to social justice and environmental stewardship. Landscape architecture is now a tool for social justice and environmental stewardship. The battle should now go to China. When Olmstead invented this word and this profession, the major issue was social justice and recreational need of the American people. And at that time, America was in a process of urbanization. Now, the same thing is happening in China, but more seriously, more severely, because of the environmental issues. America invented all these weapons. I mean weapons as ecological weapons, and these landscape ideas are tools. These are powerful tools and powerful weapons to fight for survival. The battlefield is not here in America, because you have abundance of resources. You don’t have the serious environmental problems that China has. So, the battlefield is in China, India, other developing countries, and there you can use these weapons. You can use tools, such as regional planning, ecological planning. You can’t actually use many of these planning tools in America – top-down planning tools, top-down planning theory or method, because America is such a democratic country. The battle needs a more concentrated government to build ecological, green infrastructure, a sustainable network. I think the field is in China.